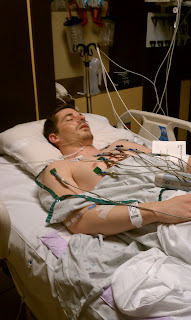 A couple of weeks ago, I was at work working away, when I get a call from Trevor, saying that I need to come get him and take him to the ER because his kidney was hurting really bad again. All i can think of is "oh great here goes another kidney stone." He scared me with this same thing right after we got back from our honeymoon... So I rush to the house to get him and we quickly rush to the hospital (Almost getting into an accident - let me add). We get there and it takes them FOREVER to even get Trevor on some pain medication for his horrible pain. The poor guy was sitting there doubled over in tears because the pain was so horrible. Finally, we were able to get some pain medication for him and he started to relax. The doctor comes in and tells us that he has a kidney stone lodged in his ureter, that is 8 mm, and that there is also ANOTHER kidney stone waiting up in his kidney to come down that is 8 mm too! So we were both like "GREAT." Anyways, the doctor gave us the option of being transfered to another Banner hospital to see the urologist and have a procedure to get the stones blasted and out of there (the urologist on-call was not at the Banner hospital that we were at) or Trevor could just go home on pain medication and he could try and pass the stone. Did they not realize that his stones were 8 mm long??? THERE WAS NO WAY HE WAS GOING TO PASS THE STONES... STUPID.. We decided that we wanted to be transfered to get the procedure done and get the stones blasted right away. We were pretty set on what we wanted to do. Little did we know, the urologist at the other hospital was making a plan of his own. The doctor comes back in and says that the urologist said that he does not want to see Trevor tonight, that he wanted Trevor to be sent home on pain medication, and to call his office first thing in the morning to get the procedure scheduled for that morning. So, we thought that wouldn't be a big deal to wait until tomorrow morning. We went home and got through the painful night. So i decide to call a different urologist and get him in for an appointment that day. We go in and that urologist tells us that we won't be able to get a procedure scheduled for a couple days. 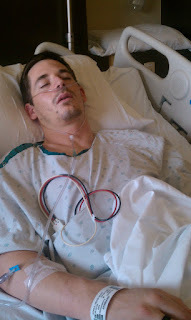 Here is my poor husband in a ton of pain and they tell us that we have to wait a couple of days. So we go home and decide to wait it out on pain medication until we can get the procedure scheduled. That Saturday, Trevor was taking a nap and I was cleaning down stairs. Out of no where, he yells my name and I go running upstairs panicking. I go up there and see him shaking (i thought he was having a seizure) and he had a fever of 100.4!! I quickly called 911 and the paramedics got there right away. 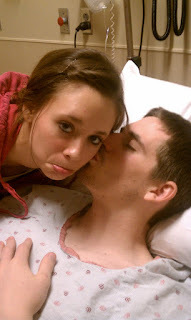 Trevor was then taken to the hospital and we were there yet again... They told us that Trevor was septic, had a really bad kidney infection, his liver was shutting down, his kidneys were shutting down, his white blood cell counts were down, and by this time he had a temperature of a 103. My poor Trevor... We were so sad and devastaed... 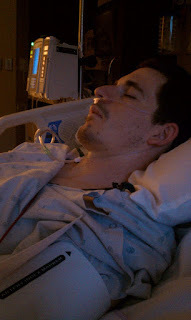 If only the stupid urologist, from the first night we were there, would have taken him and done the procedure or if he would have taken him the next morning, Trevor would not have been almost dying from a septic kidney infection. as Trevor was. THANKFULLY that was not the case. I thank Heavenly Father everyday. 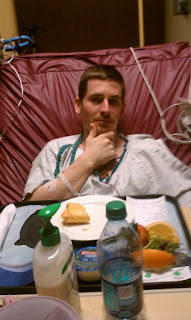 We were there for a couple more days and then they finally sent us home after his infection was under control. Now we have to go through three more procedures in order for Trevor to get better. One was just done today and that was to blast the biggest kidney stone. The second will be to blast the second kidney stone and the third will be to take the the stent out. Hopefully after that last procedure, we will be done for a long time! Trevor just coming out of the first procedure when they put the stent in. Trevor has been through so much these last couple of weeks and it was so hard to sit there and watch him go through it all. Tears would fill my eyes and my heart would sink every time I would even look at him. It made me so sad to see him go through what he did. I am so proud of my husband and the strong person that he is. He is so good to me and I could not picture being with a better person. Heavenly Father truly has answered my prayers and everyone else's prayers in our behalf. We are truly blessed and I know that our Heavenly Father is watching over us. I love my Trevor and am so glad that I have him back. I was really missing him for a while... Trevor and I are also grateful for all of you that kept us in your thoughts and prayers. It really meant a lot to us! ahh! scary! glad everything turned out ok! Oh wow! I got sad FOR you thinking that you might have lost your husband too early. I'm glad Trevor is on the right path.